In this two day class, students will learn 'hands-on' designs for the wedding party, including techniques used for current trends and classical bouquet styles. Various styles, such as the "Duchess Rose", the contemporary cascade and hand-tied bouquets are taught. In addition, students will lean beautiful unique personal floral accessories, fashionable boutonnieres, wristlets and corsages. 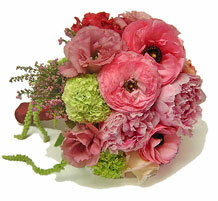 Tips for pricing and selling wedding flowers are included. European bouquet styles and techniques. High-style treatments incorporating unique and progressive concepts. Pricing and selling wedding flowers tips.